While it's hard to make blanket statements about art, it's fairly safe to say that art is always about constructing meaning in the mind of your viewers. Whether it's a cheeky visual pun or a serious reflection on the state of society and culture, the goal is to create an impact. Few things are more serious threats to the state of the world today than climate change, which is going to have serious and wideranging impacts in every part of the world, but Maine artist Jill Pelto has made it her mission to showcase the dangers through art. As we've discussed in the past, art and science often have something of an adversarial relationship, but in Pelto's case, she's managed to bridge the gap by her more conventional career as an environmental scientist. She recently graduated from the University of Maine with a dual major in studio art and Earth science, and she brings her dual passions into the work she creates. Her data is all sourced from unimpeachable governmental sources such as the NOAA and NASA, as well as published papers from peer-reviewed climate science journals. 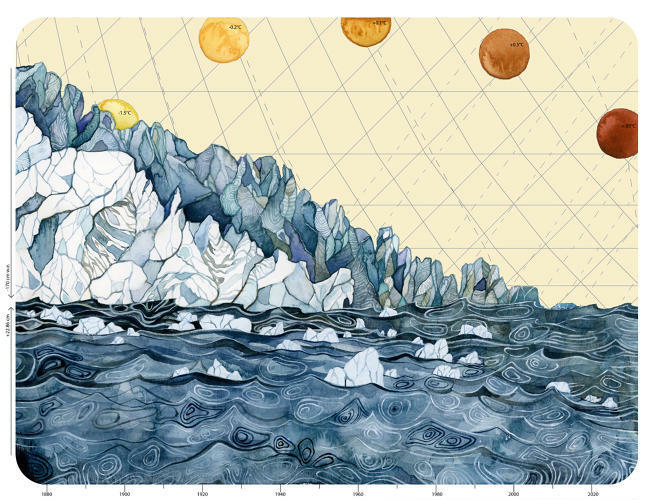 Her work is an intriguing combination of traditional media and infographics, as they are all directly correlative to climate-related data. The resulting series she has titled 'Geoglacial Artworks', and it is art with a very real scientific message. Each piece is a blend of actual graphable data that has been filled in with related visual imagery. "I think that art is something that people universally enjoy and feel an emotional response to," she said in a recent interview with Smithsonian Magazine. "People across so many disciplines and backgrounds look at and appreciate it, and so in that sense art is a good universal language. My target audience is in many ways people who aren't going to be informed about important topics, especially scientific ones." Many artists are very socially aware, but at the same time it's all too easy to lose ourselves in the art world and begin to ignore the connection between the work we do and the world we're intending to impact. Pelto's work neatly and appealingly bridges this divide, and hopefully she'll be able to succeed in raising awareness about the seriousness of the climate change situation.